Tarle & McAllister Appraisals Inc. is a leading provider of professional valuation services for residential, commercial, industrial, institutional and agricultural real estate in the Eastern Ontario Region. Here you will find information about the services we offer and details about Appraisers and Appraisal services from the Appraisal Institute of Canada. Tarle & McAllister Appraisals Inc. was founded in 1991 and has been providing professional and respected real estate appraisal and advisory services in South Eastern Ontario ever since. To this day we strive to maintain the high standards of professionalism and integrity on which the firm was founded. Our appraisal and consulting staff have decades of combined experience in the field of real estate valuation and consulting. We have years of combined education and training and a thorough knowledge and extensive expertise in South-Eastern Ontario. Our Clients include all levels of government, financial institutions, national corporations, law firms and private individuals. Our independent valuation and consulting services are widely respected and universally accepted with Canadian lenders as well as judicial and regulatory bodies. As members of the Appraisal Institute of Canada and the Institute of Municipal Assessors of Ontario, a strict Code of Ethics and Canadian Uniform Standards govern our practice. 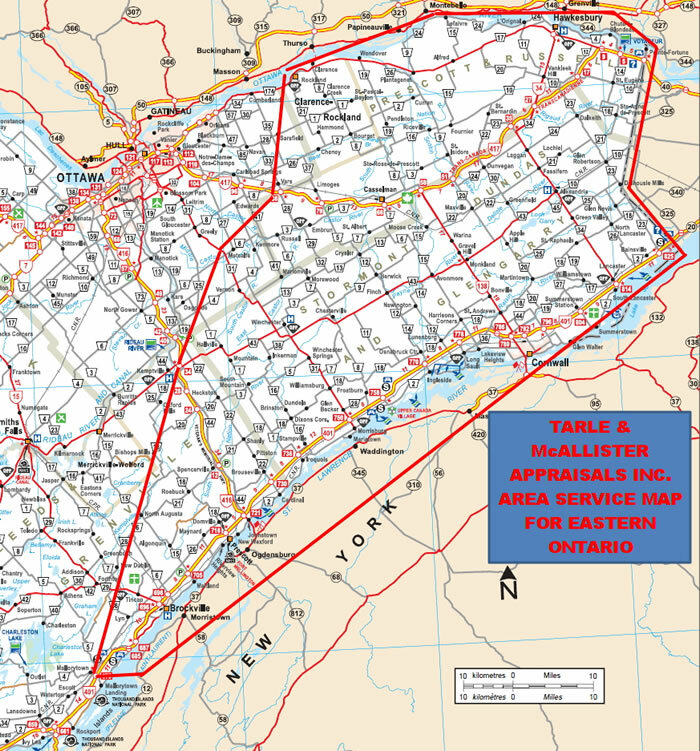 Tarle & McAllister Appraisals Inc is based out of Cornwall, Ontario and provides residential and commercial appraisal services over most of south-eastern Ontario from the Quebec border east covering all of Stormont Dundas & Glengarry Counties and Prescott-Russell Counties and into Leeds Grenville. Please Call or contact our office for a quote. Sean is a local resident who has worked as a Real Estate Appraiser in Eastern Ontario since 1987. He graduated from St. Lawrence College, Cornwall Campus in 1987 with a diploma in the Appraisal Program and has successfully completed numerous courses provided by the Appraisal Institute of Canada. He is an Associate Member of the Institute of Municipal Assessors of Ontario and holds the AACI designation as granted by the Appraisal Institute of Canada. Sean has extensive experience in all property types and assignments: from small residential to complex industrial, commercial, agricultural and institutional properties. Todd Lapierre joined Tarle & McAllister Appraisals Inc in July of 2003 after 9 + years working in the mutual fund industry. As a Canadian Residential Appraiser within the Appraisal Institute of Canada, Mr. Lapierre’s focus over the past 8 + years has been on appraising residential properties in addition to small investment properties. Todd is currently working towards his AACI designation which will allow him to appraise commercial and industrial properties. Whether for financing, estate settlement, purchase, sale or marriage / separation purposes, Todd looks forward to providing you with the excellent service that you expect and deserve. Shirley joined Tarle & McAllister in 1996 and, in her role as Office Manager, continues to be the “front line” contact to many of our clients. Shirley is responsible for managing and maintaining the extensive database of information that is required to be a leading appraisal firm. Her experience and understanding of the appraisal profession enables her to effectively manage the day to day operations of the office in an efficient manner. Jane joined Tarle & McAllister Appraisals Inc in February of 2002 as a Candidate Member of the Appraisal Institute of Canada and was granted the CRA designation by the Institute in October of 2007. Over the years Jane has gained valuable experience and training relating to residential and rural appraisals. Her background in the dairy farm industry and experience as an appraiser provides her with a thorough understanding of residential, rural and agricultural property values. Cory joined Tarle & McAllister in 2011 after spending ten years working in the Hospitality industry throughout western Canada. Cory returned to Eastern Ontario and was awarded his CRA designation through the Appraisal Institute of Canada’s candidate program in 2016. The Candidate program pair’s intensive web based academic courses, offered by the UBC Sauder School of Business, with the ability to obtain valuable practical experience under the mentorship of Sean McAllister. Cory’s current focus is on residential appraisals as he works toward the a long term goal of obtaining the AACI designation. Megan joined Tarle & McAllister in 2013 as an administrative assistant. Megan works closely with the Office Manager and the Appraisers to facilitate a variety of organizational, research and data management tasks. Megan is responsible for the day to day maintenance of our sales and file management databases and provides clerical and administrative support to the team at all levels of the appraisal process. An appraisal is a formal, impartial estimate or opinion of value, usually written, of an adequately described property, as of a specific date, and supported by the presentation and analysis of relevant data. It is prepared as a result of a retainer, for reliance by identified parties, and for which the appraiser accepts responsibility. While professional standards do not dictate the form, format or style of reporting, the appraiser is bound by certain recognized rules as to content. The extent to which this content is detailed will determine the appropriate type of appraisal report to be prepared. Typically, types include a bound narrative - from concise and briefly descriptive to comprehensive and detailed - and a form report generally used to support a residential mortgage application. Any limitations imposed on the assignment may affect the level of risk accepted by each party to the assignment. In every case, however, the appraiser must comply with the standards of professional practice. Most commercial appraisals are Full Narrative reports, appropriate where all aspects of an assignment are researched and reported. No modification or exclusion of a Standard Rule (requiring what is referred to as an Extraordinary Limiting Condition) is permitted in a Full Narrative report. A regular Narrative report may provide details generally equivalent to a Full Narrative, but is distinguished by the invoking of an Extraordinary Limiting Condition. Examples would include situations where no title search is made, or where no interior inspection of a building was possible. A Short Narrative report is concise and briefly descriptive. A Form report is generally represented by its standardized format combining check-off boxes and narrative comment. other descriptive support material such as maps, plans, charts, photographs, etc. This is a form completed by the appraiser on a residential property. The report includes general information, such as who owns the property, the address, legal description, taxes, assessed value and age of the dwelling. It also describes the neighborhood in terms of its age, distances to schools and shopping centres, common types of dwellings, services and utilities available, etc. - The Cost Approach - estimates the cost to build a new building identical to the subject being appraised, at current prices, subtracting accumulated depreciation and adding the estimated land value. - The Income Approach - relates to income-producing property and is based on the theory that value is the present worth of the income stream, which the property is capable of producing when developed to its highest and best use. The net operating income from the property is capitalized into value by an appropriate method and rate. - The Direct Comparison Approach - is based on the theory that an informed purchaser would pay no more for a property than the cost of acquiring another existing and equivalent property. The value estimate is based on the selling price and listings of comparable properties. To arrive at a final estimate of value, the appraiser selects the value indicated by the approach most appropriate for the property and supported by the most reliable, factual and relevant market data, which has been analyzed and verified. You've decided it's time to buy a home. This is the single largest investment that you will make in your lifetime. That's something that can be pretty intimidating. Also intimidating is the number of people with whom you will deal with as you look at buying that perfect house. There are a lot of people with a vested interest in your purchase. The real estate agent earns a commission. The vendor wants to get the best price possible. The city charges taxes on home and property. The bank gets a mortgage. A lot of people are involved, directly and indirectly, and each one has their own agenda. Combine that with changing property values, market trends and new laws, and it can seem like there's no one really looking out for you. You may be asking yourself, "who's looking after my best interest?" - "who can I trust?" 7) Appraisers are Real Estate Consultants. When you hire a member of the Appraisal Institute of Canada, you're hiring a professional you can trust. They work for only one person: you. It's their job to determine the market value of any home or property so that you know the value of what you are buying or selling. Tarle & McAllister Appraisers and Advisors are members of the Appraisal Institute of Canada. Obviously, the key word is "value". An appraiser may be hired by a company or institution to perform any of these duties, but you can also hire an appraiser independently to give you an objective opinion on any of these subjects. It's a little known fact that CMHC insured mortgages do not typically have an appraisal prepared. That's all the more reason for you to hire someone who'll give you the professional insight you need to make an informed decision. Knowledge is the cornerstone of appraisal. A designated member of the Appraisal Institute of Canada has had years of education and training and puts all of it to work for you. It is their professional responsibility to keep up to date with changes in market trends and laws that affect real estate values. Combining their knowledge and expertise with a thorough investigation of the property and the area, an appraiser will give you a professional opinion that you can trust. "Subject to a full appraisal being performed and meeting or exceeding the agreed offer". You're not just looking for a house; you're looking for a home. Someplace where you will spend several years and build many memories. It's not just an investment of money; it's an investment of yourself and the years you spend there. Before you sign on the dotted line, insist on having a designated member of the AIC involved in your decision. We're on your side. Tarle & McAllister Appraisals Inc.